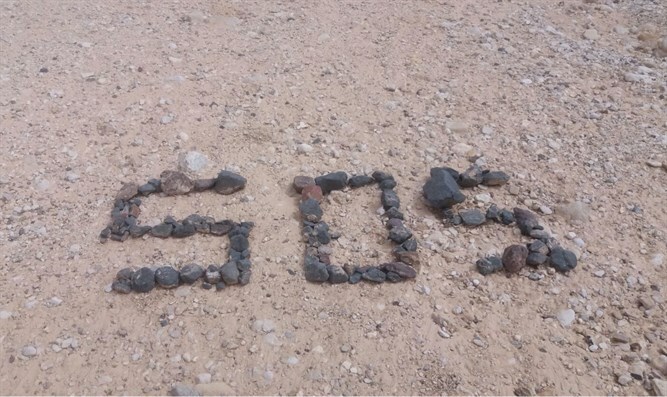 Couple lost in Negev in dangerous heat make SOS signal out of stones to allow rescue aircraft to find them. A Tel Aviv couple in their 30s who lost their way while on a trip to the Negev region were rescued by the Negev Mountain Rescue Unit Tuesday. The two were found in a state of dehydration after they made a large SOS signal out of stones. The couple were supposed to check into a hotel in Mitzpeh Ramon on Sunday. They went for a walk but lost their way. Their family members, who discovered that the two did not arrive at the hotel, called the search unit, which launched a search and rescue operation. A helicopter crew found the couple waiving at them and saw the SOS signal. The two were evacuated to Soroka Hospital in Be'er Sheva, where they received medical treatment and were released in good condition. Temperatures in the Negev reached a high of 97 degrees Fahrenheit Tuesday.